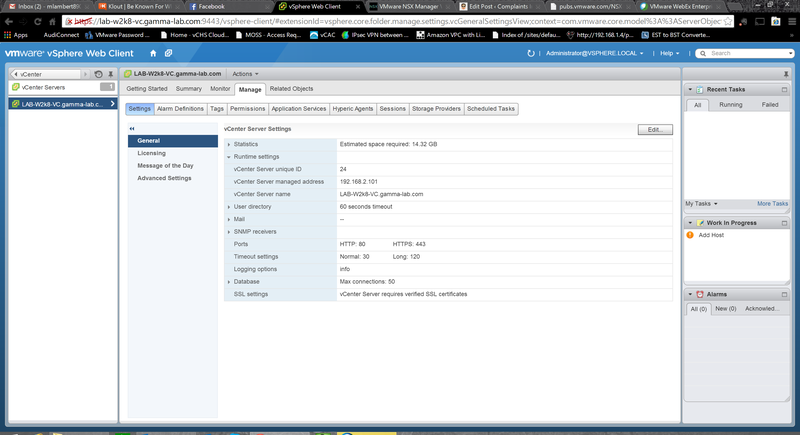 Under Host Preparation, we can see any clusters in our vCenter configured with a vDS. In our case there can be only one! The Manager will start the download of the VIB to the hosts, and trigger the scripted install. All of the usual automated workflow orchestration for VIB installation applies. Lots of things can trip this part up, mostly attributable to host or network misconfiguration. Our environment is sparking clean so we have nothing to worry about! And just like magic we…. Wait… What the heck is this?! Hmmm… So much for our clean environment! Looks like it failed. Luckily there is a handy “Resolve” hyperlink. Let’s click it. manage logical switches: This one is a no brainer. 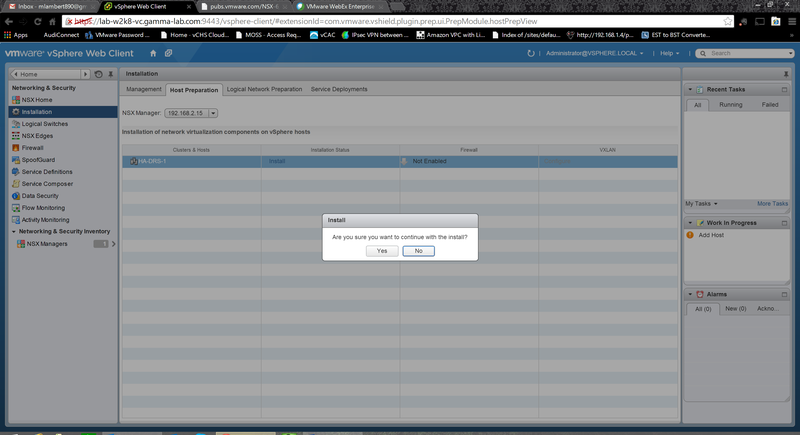 Have right permissions before configuring. Basically you need super user for this. The easiest way to wrap ones mind around overlay networking is to walk through a “day in the life of a packet”. Remember that the guest OS has no clue that it’s being virtualized (for the most part, but close enough for this discussion). It simply formulates Ethernet frames and sends them through the NIC driver. An Ethernet conversation, of course, starts with an ARP broadcast to find the destination Ethernet address associated with the IP address you’re attempting to connect to. 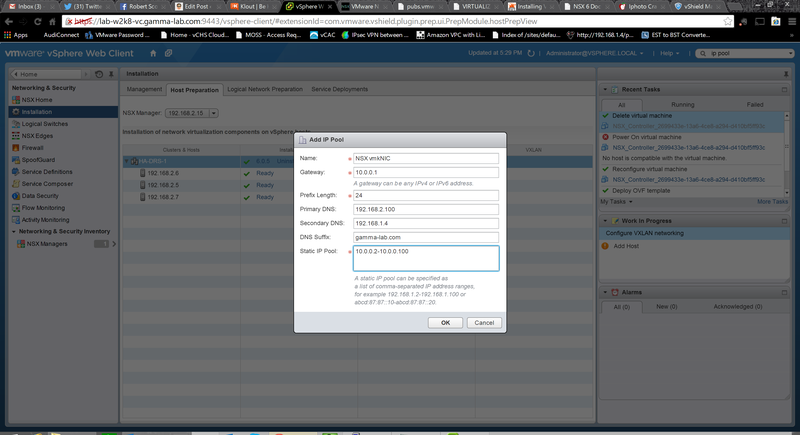 This ARP query is processed by the vNIC the way a physical NIC would and it is put “on the wire”. 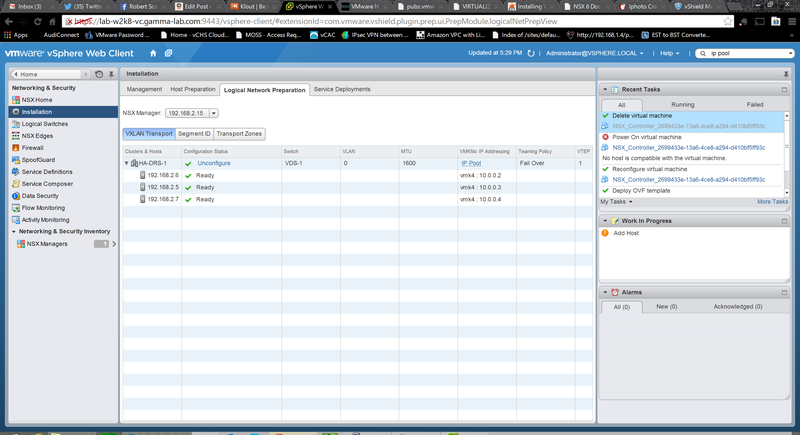 Of course in this case “on the wire” means on the virtual switch hosted by the hypervisor. If the destination address exists within the ARP table of the vswitch (meaning a VM also attached to the same vswitch and running on the same host), then the ARP query is passed to that host and the conversation never leaves the hypervisor. If this is not the case however (which means the destination VM lives on another host – common in a vDS environment even if the guests are on the same logical network), then the frame is sent down toward the physical NIC which is acting as the vSwitches uplink. In an overlay scenario the frame is intercepted by the handler before it gets to the physical NIC driver on the host. This is why for VXLAN we have to install a VIB. The handler catches the frame and then handles it. This means using its own logic to determine where the frame should go and then send it there. 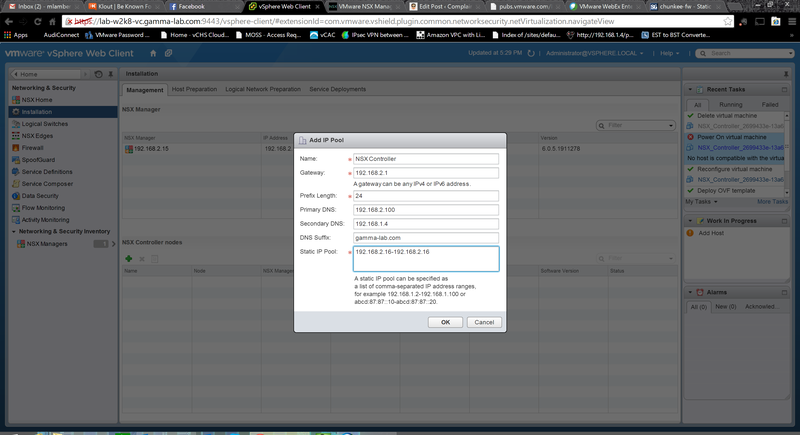 In the case of VXLAN this means over a Virtual Tunnel Endpoint (VTEP) to the correct VXLAN destination over layer 3. That is where the encapsulation comes into play. So we are taking an entire 1500 byte Ethernet frame and packing it into another one to send over layer 3. And this is where the larger MTU comes into play. Using a 50 byte larger MTU ensures we don’t have to fragment every time an overlay frame is sent. So what the pre-req is referring to is to set the physical MTU to 50 bytes larger than the VXLAN MTU (the “virtual machine MTU”) All documentation, however, really recommends setting it to 1600. I feel the documentation here should have been more clear as “virtual machine MTU” is pretty ambiguous, but there it is. 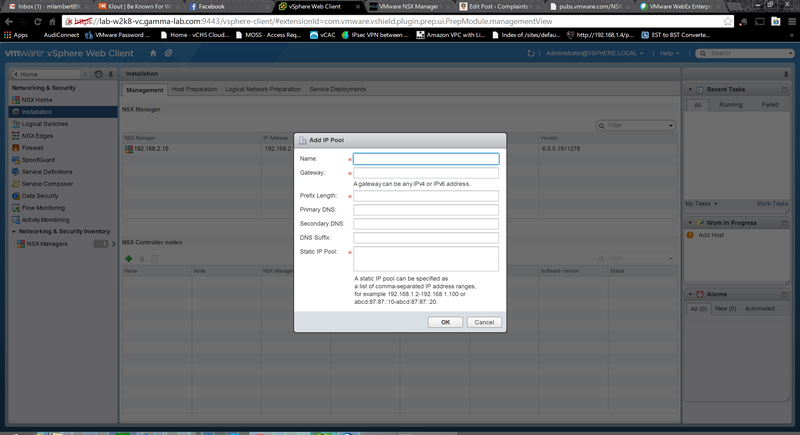 Also worth noting is “logical switch” in NSX parlance is actually referring to “VXLAN”. So with all of this in mind, we can go ahead and change that physical MTU of the VMKernel NIC that is attached to the vDS to 1600. 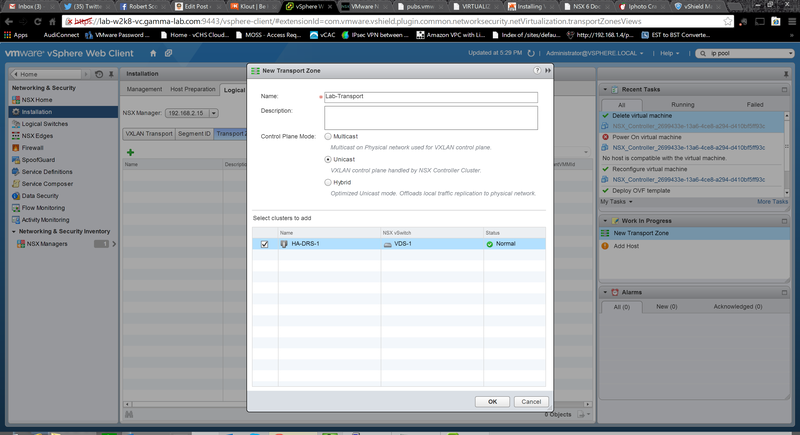 DHCP is available on VXLAN transport VLANs if you are using DHCP for IP assignment for VMKNics: this one catches me all the time as I don’t use a DHCP server on the transport VLAN. If you don’t you need an IP pool or the configuration will break since vNICs will get an autoconfig address (169.254). As we will see later, we’ll have an opportunity to associate an IP pool if we don’t want to deploy DHCP in the transport VLAN. We have a bunch of questions to answer to configure our first controller. 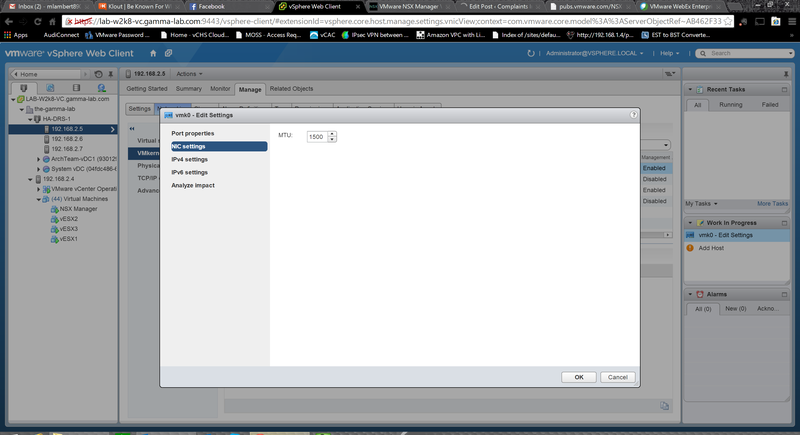 NSX Manager obviously refers to the NSX Manager we are pairing with, created in our first entry. Datacenter should be set to the vDC we are supporting. 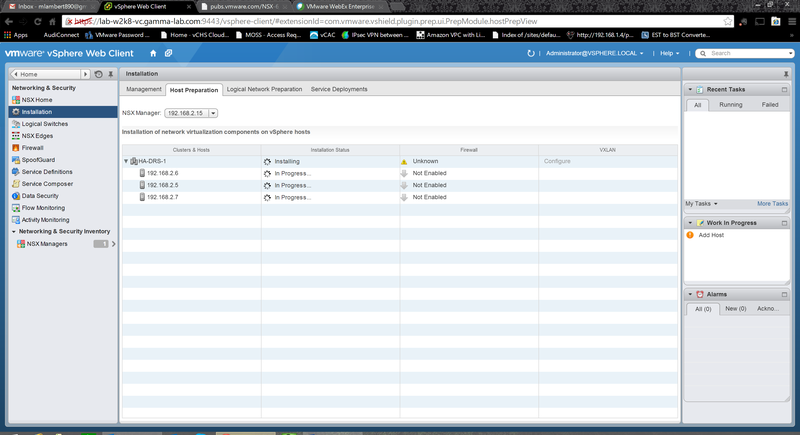 Cluster Resource Pool refers to the HA/DRS cluster we are NSX enabling. Datastore is the datastore where the controller VM should be created (note in this case we’re installing to a vSAN datastore – more on that later) and host is the host on which it should be instantiated. Connected to refers to the network to which the controller VM should attach while IP pool is how the node will be addressed. 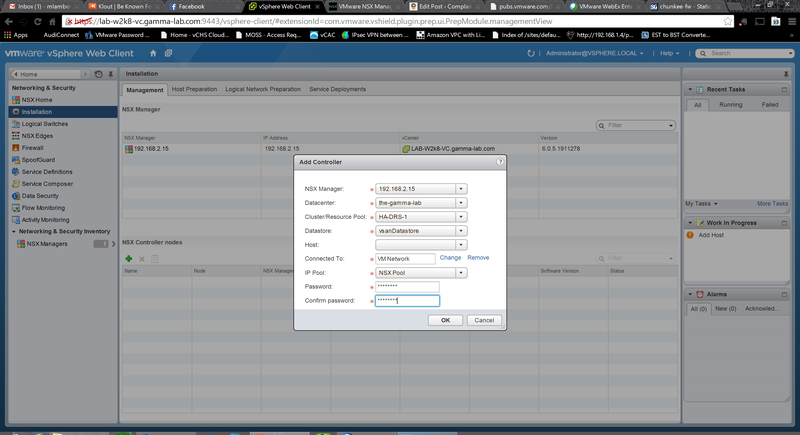 Finally password sets the admin password for the controller appliance. 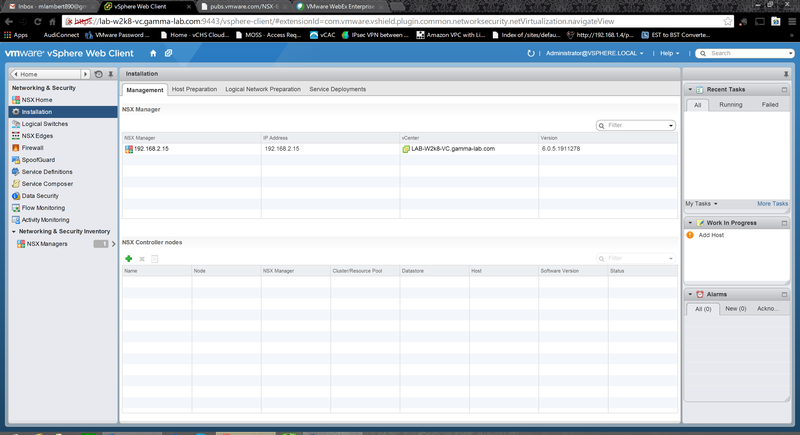 2014-09-16 23:07:14.059 GMT INFO taskScheduler-33 DeployOvfTask:173 - Deploying VM 'NSX_Controller_bc0ed3c4-5182-4448-af0c-dcb46eec3e9f ' using the OVF file. 2014-09-16 23:07:14.114 GMT INFO taskScheduler-33 OvfInstaller:359 - OVF is not being imported under a vApp and a folder has not been s pecified. 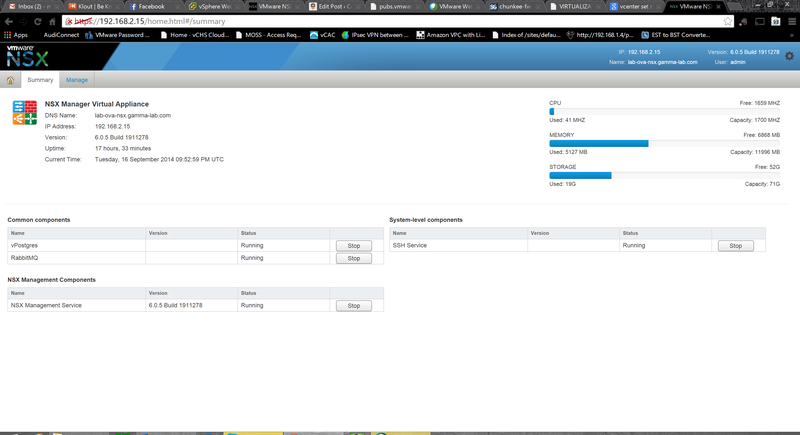 Trying to associate with the root VM folder of the data center. 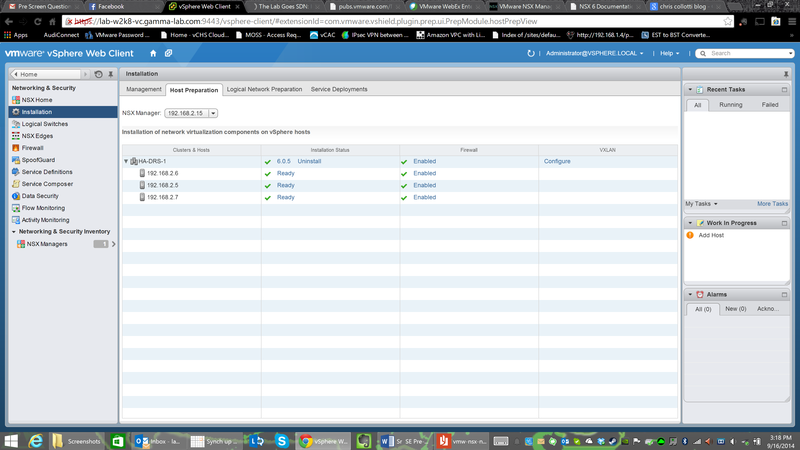 2014-09-16 23:07:14.742 GMT INFO taskScheduler-33 OvfManagerImpl:120 - Creating OVF import spec. 2014-09-16 23:07:14.812 GMT INFO taskScheduler-33 OvfManagerImpl:122 - Created OVF import spec successfully. 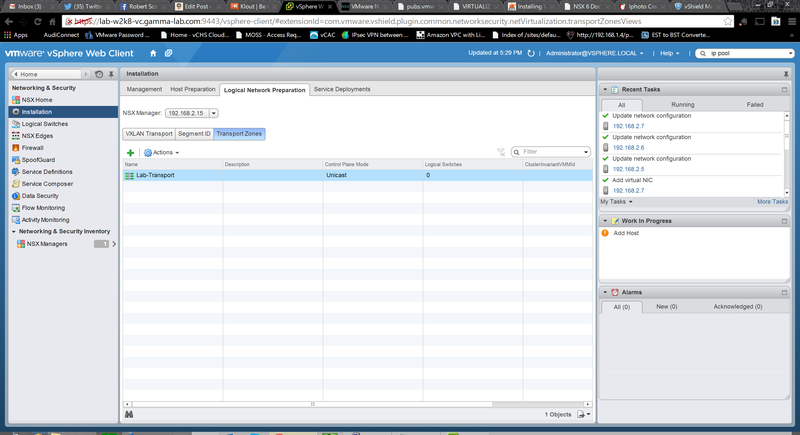 2014-09-16 23:07:14.862 GMT INFO taskScheduler-33 OvfInstaller:427 - Changing the number of CPU cores in the OVF import spec to '1'. 2014-09-16 23:07:14.862 GMT INFO taskScheduler-33 ResourcePoolVcOperationsImpl:320 - Importing VM into the resource pool. 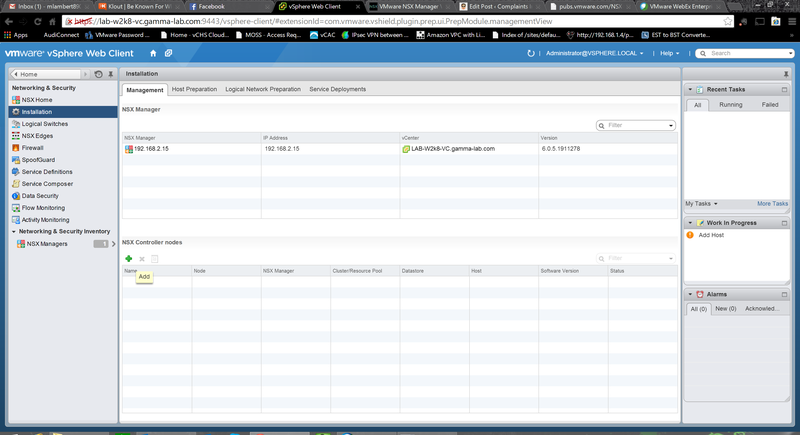 2014-09-16 23:07:14.905 GMT INFO taskScheduler-33 ResourcePoolVcOperationsImpl:322 - Waiting for the HttpNfcLease to be ready. 2014-09-16 23:07:19.239 GMT INFO ViInventoryThread ViInventory:1304 - 84/164 objects published. 2014-09-16 23:07:22.400 GMT INFO ViInventoryThread ViInventory:1304 - 84/164 objects published. 2014-09-16 23:07:23.301 GMT INFO ViInventoryThread ViInventory:1304 - 85/165 objects published. 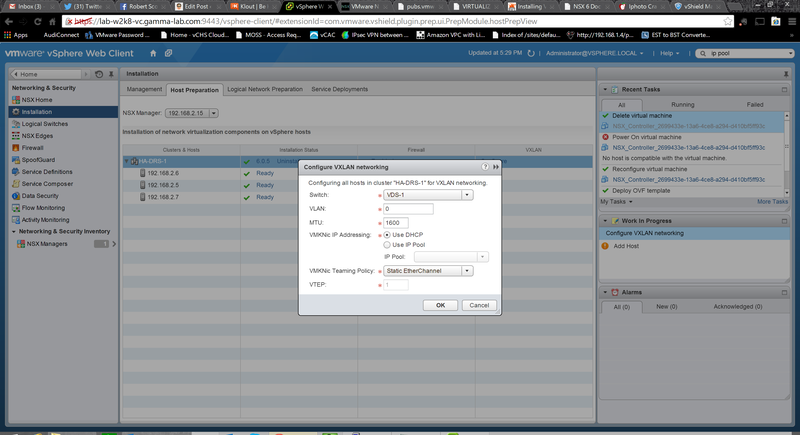 2014-09-16 23:07:24.222 GMT WARN VirtualMachineDvfilterMonitor-1 VirtualMachineWorkQueue$WorkQueue:255 - Host not found for Vm vm-556, bypassing. 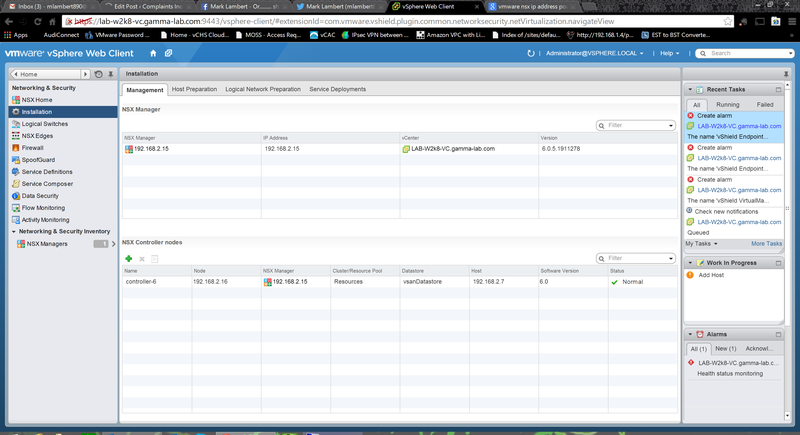 2014-09-16 23:07:24.223 GMT WARN VirtualMachineDvfilterMonitor-1 VirtualMachineWorkQueue$WorkQueue:279 - no host found for vm-556, remo ving. 2014-09-16 23:07:26.810 GMT WARN taskExecutor-18 AbstractActionEventListener:61 - User Identity Action Event Listener: Error happened w hen dispatch action events. Huzzah! Well that’s (more than) enough for this entry! Next up will take a deeper look at NSX implementation up the stack, edge device capabilities, and talk through some use cases. Stay tuned! 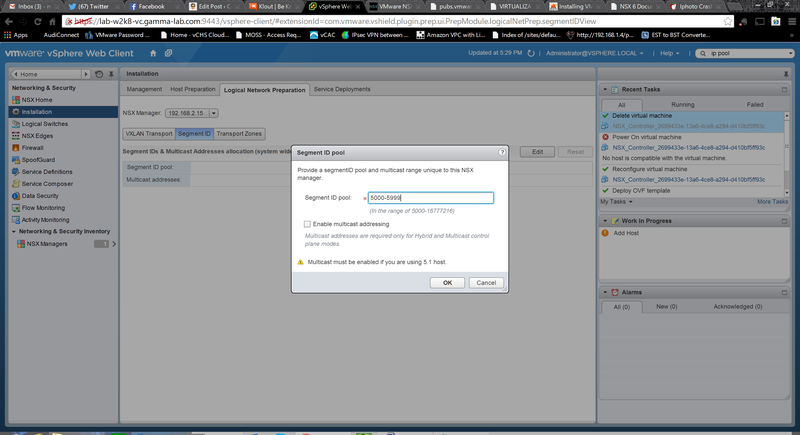 The Lab Goes SDN: Part 3 – Living on the (NSX) Edge!